What are the dates for the ride? I’ve never biked that far before… will I be able to make it? Where do riders stay along the way? I’m a serious cyclist and have gone on several long rides before… will I be bored? What if I can’t finish the ride (due to exhaustion, injury, etc.)? What is the route and how long is it? Will I be safe during this ride? I can’t come on the ride, but I want to support this project. How can I be involved? When does registration open and when will I know if I have a spot? Should I register if I can only come for part of the ride? What does it mean that you “prioritize people directly impacted by incarceration” in the registration process? Am I likely to get a spot on the ride if I’m placed on the waitlist? Where does the money go and why? What are strategies for raising money? What if I can’t raise the $300? I don’t have a bike or I’m concerned that my bike isn’t suitable for the ride. I have never camped before OR I don’t have camping gear. What services (food, support) does NOLA to Angola provide? What happens when we arrive at Angola? The ride is always the third weekend in October. This year’s ride will be October 19th-21st, 2018. For many people, NOLA to Angola is their first long ride. If you have a decent bike and you train a little, you will be prepared to complete the ride. To support you, we host various group training rides leading up to the October ride to help you prepare. We also have support vehicles that accompany the ride, so if you really need a break, you will be able to sit down in a car for awhile. If you have specific concerns around injuries or other factors that might prevent you from completing the ride, please contact us at info@nolatoangola.org. Our goal is to make this ride accessible for as many people as possible! We camp! The first night we will pitch our tents on the grounds of a friendly Union Hall in Gonzales and the second night we will stay at the West Feliciana Sports Park. We are happy to help you find an appropriate tent and camping gear, especially if you have never camped before. We encourage riders to share tents and can definitely loan you a sleeping bag, flashlight, and other gear if you let us know in advance. People of many different ability levels do the ride. Although you are welcome to ride at any speed you like, there will be folks on the ride who are not used to riding such long distances and we will ask you to wait for the group at various points, especially regrouping at lunch every day. Along with a bike ride, Nola to Angola is intended to be an educational and social experience and we want you to be part of that regardless of your cycling skills. We have several support vehicles that accompany the ride. If you need a break, we will put you in a car and place your bicycle on a bike rack. You will then get to travel around with our support crew, helping to fix flats or cook meals! If you know ahead of time that you have a recurring injury or might need a spot in a car for whatever reason, please advise us at info@nolatoangola.org. What is the route and total mileage? The route is subject to change, but click here to see a map of the 2016 route. The total mileage is approximately 165 miles spilt over 3 days. Day 1 is 68.5 miles, Day 2 is 70.5 miles and Day 3 is 24.8 miles. All activities carry inherent risks and the Nola to Angola ride is no different. We have a medic on the ride and several first aid kits for minor injuries, and all organizers have gone through a basic first aid training. We have also developed a route that we believe is reasonably safe and several portions are on isolated bike paths. We will provide you with as much information as we have about the road and traffic conditions in advance. However, you will be riding on roads with traffic! Traffic is not stopped for this ride. Occasionally, those roads will be very busy. For example, there is a portion along Airline Highway. We ride in groups and only in daylight, but ultimately you are responsible for remaining alert and keeping yourself safe. If at any time you feel unsafe riding on a particular road, you can request to be placed in a support vehicle and we will drive you until you feel safe returning to your bicycle. In the past, we have had children (as young as 11) complete the ride and we are open to having children in the future. However, for all riders under 18, we require that a legal guardian attend an info session and sign a waiver and we also require that each person under 18 has a guardian (legal or otherwise) who is willing to specifically look out for them on the ride. We also ask that each young child (under 14) on the ride has a specific seat in a support vehicle reserved for them in case they need to take a break. We also reserve the right to determine that certain portions of the road are too dangerous for young children and mandate that they ride in support vehicles until the route is deemed safe again. Donate to the ride! Our number one goal is to sustain and expand the bus service that Cornerstone is able to provide. Host a fundraiser that benefits Nola to Angola! Some past examples include bartenders who donate their tips to the ride; movie nights around incarceration where the ticket sales go to Nola to Angola, or even individuals who donate a percentage of their business’ profits to NTA on a specific day. (We are lucky to have among our supporters artists, potters, and yoga instructors who have supported us generously). We are happy to attend and help promote any event you organize. Food: Our food crew can use a lot of volunteers in advance and during the ride. We need help soliciting food donations, picking them up, cooking in the days right before the ride, and packing everything into cars. Publicity/Press: Help us raise awareness about the Nola to Angola ride and the Cornerstone Bus Project. This could mean posting/dropping off/designing flyers, reaching out to organizations that might be interested, sharing your press contacts with us, or creating media that raises awareness of the project. Drive a support vehicle and/or lend your car: We receive more offers to drive support vehicles than we can accommodate so we turn most people down. However, you are welcome to inquire. Volunteer for one of the many prison reform and prison abolition organizations in New Orleans, some of which are listed in our allies/resources section. Join the fight against mass incarceration in our city and our state! Registration will be open July 1st to 11:59pm on July 20th. Riders will be notified if they have a spot on July 25th. All other riders will be placed on the waitlist. Each year we have offered a spot to a significant number of riders on the waitlist, so don’t give up hope! We ask that you only register for the ride if you can commit to attending all 3 days. We have far more interest than we can accommodate and we do not want to take up spots with folks who can’t commit to the whole 3-day experience. If you have extenuating circumstances that merit further conversation, please email us at info@nolatoangola.org. One of our goals is to make the Nola to Angola ride accessible to individuals who have been directly impacted by incarceration. We define “directly impacted” as: you, or a family member/loved one, has been incarcerated for months or years. All directly-impacted individuals will be guaranteed a spot on the ride and we can also waive fundraising requirements if those would be in any way stressful or prohibitive. Every year we have taken 10-20 people off the waitlist. However, we can’t make any guarantees. Many people drop out at the very last moment, so keep in touch if you remain interested! Registration fees cover the cost of the ride and all proceeds raised are donated directly to the Cornerstone Bus Project. Cornerstone provides free buses for family members to visit their incarcerated loved ones. The buses leave monthly from New Orleans and quarterly from Shreveport and travel to 5 different prisons throughout Louisiana (Angola, Rayburn, Dixon, Hunt and Avoyelles). Cornerstone also has a re-entry program and a mentoring program, though those are not funded by Nola to Angola. We partner with Cornerstone to highlight the great distances that family members must travel to visit their loved ones. The partnership also reflects our commitment to fund and support the work of formerly-incarcerated people. Use social media to post information about the ride, or press from past year’s rides, to garner interest and donations from your online networks. We also have cool posters (from previous years) you can give away if you’d like as a thank-you… Or you can make your own thank you craft/gift/note/reward system. If you’re feeling like you won’t get $300 just through your social networks, you can also host a fundraising party/event, like a Harlem Rent Party or send letters to local businesses asking for donations. You can see on our Allies/Resources Page the organizations that are already donating to us, but what about your favorite coffee shop? Or restaurant? Or bike shop? Or bank? If they give enough we’ll even thank them on our website & make them an official sponsor! Donate the proceeds from an event you run — your tips if you’re a bartender, a portion of proceeds if you run a class or sell a product. Make it personal–share what compels you to do this ride, why it’s important, what you hope to learn from it, what the challenges will be. Financial hardship should not prevent you from doing the ride. Please reach out to us as early as possible if you think you won’t raise the money and we will work with you! If you don’t communicate with us and do not raise $300 by the day of the ride, we will not invite you on the ride. We are happy to help connect riders to functional bikes, though we cannot guarantee a bike for everyone. We also have several mechanics available to check your bike at all info sessions. ALL riders are required to get a tune-up before the ride and check that their bike is in good working condition. It’s frustrating to feel like you can’t keep up with others due to a poorly working bike. Please reach out to us ASAP if you need help securing a bike or have questions about the suitability of your bike. Though we have had riders use mountain bikes or cruisers in the past, we generally recommend that riders use a road bike. There are a few significant hills on Day 3 but otherwise the ride is largely flat, making single speed bikes a fine option. We encourage riders to share tents (to reduce the amount of gear we carry) and are happy to help connect you to other spare camping gear. Let us know ASAP if you know you will need to borrow a tent, sleeping bag, or other gear. Every year, we have riders who are camping for the first time. We will support you and you will have fun! We do have bathrooms available both nights. Riders carry basic supplies with them during the day and should have a bag/saddle bag/backpack for water, snacks, meds, spare tubes, and extra layers/rain gear. You are required to wear a helmet. All your other supplies will be carried in our support vehicles. You should consider packing a tent, camp pad, sleeping bag, change of clothing (including something warm), toiletries and a flashlight/head lamp. Please pack as light as possible–carting 60+ people’s stuff around really adds up. Our support team provides meals for the ride, basic medical supplies, water refills throughout the day, and bike repair tools. If you have never been to a prison before (or even if you have), visiting Angola can be an intense experience. The ride coincides with Angola’s annual rodeo and craft fair. Riders are not allowed to attend the rodeo due to time constraints (unless you have your own ride back), but most riders choose to go to the craft fair. It costs $15 to enter and you can buy crafts made by prisoners and chat with them. We always stop by the booth of the Angolite, Angola’s prison magazine, and speak with the editors. You do not have to enter the prison grounds. Each year, several riders and organizers choose to stay at the ride’s endpoint a few miles before the prison entrance and wait with the buses. We will spend approximately 2 hours visiting the prison. Then we will all drive back to New Orleans in 15 passenger church vans. 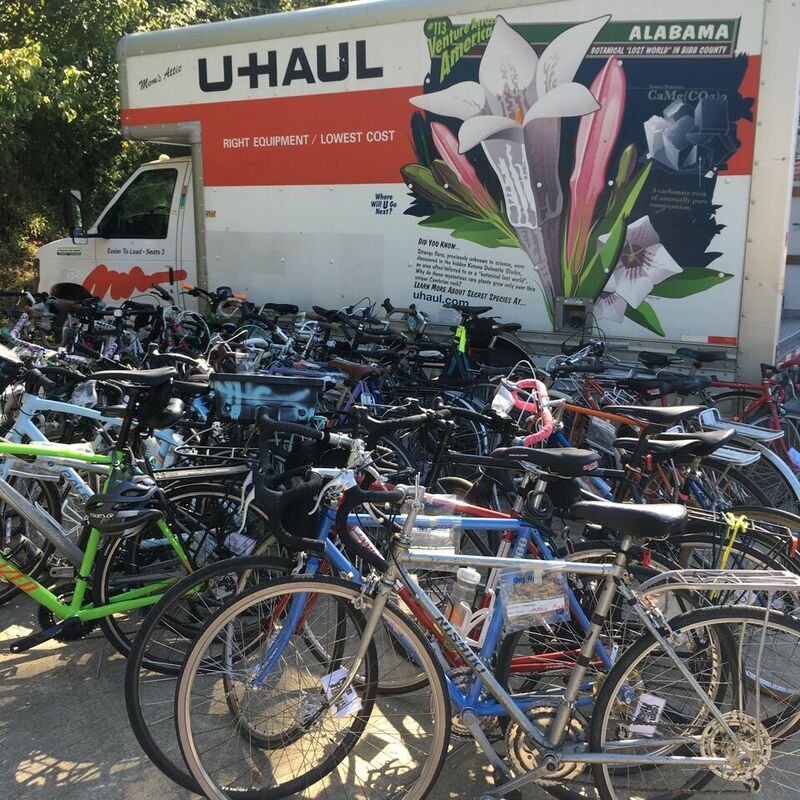 Your bike will be transported back in a U-haul. We usually arrive between 6 and 8pm.